Bosque del Cabo is owned and operated by Phil & Kim Spier. Bosque started in 1987, when Phil moved down to Costa Rica from the United States. Phil was in his 20’s at the time, and had a small business in Stuart, Florida. After five years of annual vacations in Costa Rica, he decided to purchase a tract of land for his enjoyment and to help preserve a piece of the rainforest. He picked the Osa Peninsula because it was one of the most beautiful and magical places he had ever seen (not to mention the great surfing). Bosque del Cabo now encompasses 750+ acres of land, precisely situated on Cabo Matapalo, the southernmost tip of the Osa, overlooking both the Golfo Dulce and the Pacific Ocean. Phil bought the original farm from two families that were slowly killing the land with their slash and burn techniques (perhaps these techniques were helping the families make a living, but they were unknowingly destroying the ecosystem); some of the land he bought was still smoking from the fires burning when he took possession! The previous owners had deforested about 100 acres of the total land for farming and livestock grazing. Phil wanted to reforest most of that land; he decided to leave the area in front of the restaurant and in what is now the Tropical Garden open for gardens. He reforested some others areas with plantation trees and let some grow back naturally (in hindsight, the latter was the best way to a more diverse forest). It has been very gratifying for us to see the forest and animals come back. For instance, the land bordering the driveway had been cleared for pasture; in the last 24 years it has grown into a beautiful secondary-growth rainforest where we have seen the wild peccaries and jungle cats living, as well as many other birds and animals. Each year the animal life/sightings increase- in the last couple of years we have even seen tapirs on that land! After three years of farming, reforesting, and basically living off the land, Phil decided to create a small lodge to help him make a living in a place he loved so much. He also thought that it would be a wonderful experience for guests to see and live so close to nature. He converted the part of the already open land into the gardens and built three cabins and a restaurant, and, after many ups and downs, opened two years later (in 1990). He was pleased with the results and responses of his first guests. Bosque del Cabo was among the first (and remains one of the longest running) nature lodges in the Osa Peninsula. Phil continues to enjoy living here at Bosque and tries to go surfing whenever possible. He stays very busy running the lodge, mainly overseeing the kitchen, gardeners and carpenters, and designing the buildings and bridges at the lodge. 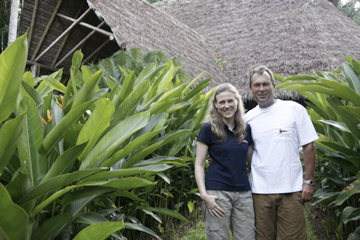 Kim and Phil met here in Costa Rica in 1995. Kim was born and raised in Louisana; attended college at U.C. Berkeley and law school at U.C. Hastings. She was a practicing lawyer in the San Francisco Bay Area when she decided to change her life and move to beautiful Costa Rica. To that end, she moved to San Jose, Costa Rica and started a small business importing wines from California into Costa Rica. 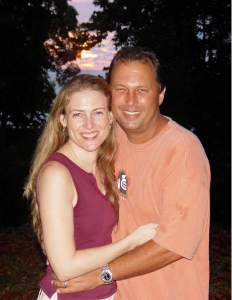 Kim & Phil started dating, and Kim eventually ended up moving to the Osa Peninsula to help Phil run Bosque. She has been at Bosque with Phil for 12 years, and has helped a great deal with the growth and management of lodge; she and Phil married in 2002 on the grounds. Kim created and maintains the website (with lots of technical help from the webmaster! ), writes the booklets in the cabinas each year, manages the lodge office, oversees the front desk staff, decorates the cabinas, houses and restaurant and helps run all the day to day workings of Bosque. 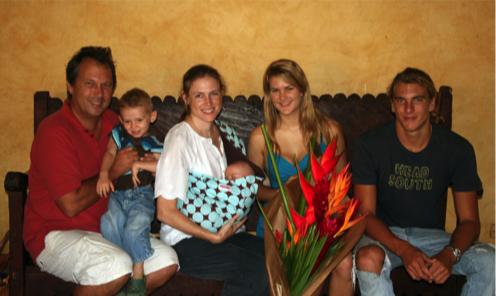 They live and raise their family here at Bosque, with Phil's oldest children (Derek, 19, & Sol, 15), now in school in San Jose and their young sons Ben (2.5 years old) and Sam (infant) with them at the lodge. Derek is in finishing high school at Country Day School in San Jose, and is preparing for college in 2010. His favorite thing to do in his time off is to surf! Sol is in high school, also at Country Day School in San Jose. 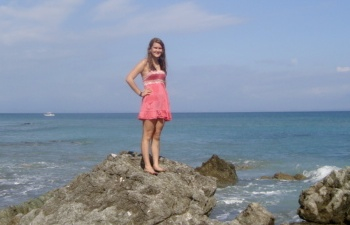 She has many friends and lots of talents, and loves to travel. 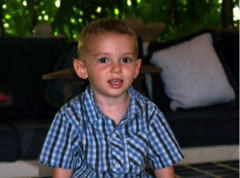 Ben is a tremendously busy toddler, curious, active and fun- and out of control. 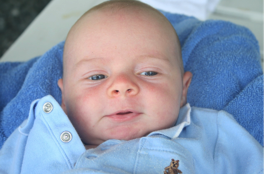 And sweet Sam was born at the end of March 2010 and is happy so far to drink milk, sleep and smile at us all. Bosque now has ten cabinas, two rental houses, a garden compound and “luxuries” that we only dreamed of including solar and hydropower, refrigeration, hot running water, cellular phone service, internet/emailing capability, and a passable road. In 1998 we, along with many neighbors, put our land in the Osa Wildlife Reserve (Refugio Nacional de Vida Silvestre Osa), which has as one of its goals the creation of a wildlife corridor from Corcovado National Park to Cabo Matapalo. Each year we assess how we can best use our efforts and funds to aid in the protection of this corridor and the area in general. One of the most important legacies that we want to leave on the Osa is a large area of protected contiguous land that can aid in the process of creating wildlife corridors and preserving biodiversity. To that end we have funded private guards to patrol our property as well as the surrounding neighborhood, and we also provided the salary for one of the Corcovado Park Minae guards during a particularly bad year for poaching in the park. This year we have "adopted" a stretch of beach in order to help protect the nesting seas turtles. In addition, we always continue to add to the Bosque land reserve. From 1999-present we have been able to purchase around 500 acres of land to add to the original 250 acre farm, including the land lining the driveway, almost a mile of beachfront, gorgeous tracts of virgin rainforest and the teak plantation situated before the main entrance to the driveway. Hopefully these purchases will insure the further protection of the forest and animals, and be a proper use of money generated by Bosque del Cabo. Additionally, we are members of, work with and support various conservation organizations. If you would like more information about these efforts please see the conservation section. We at Bosque continue to be committed to staying environmentally low-impact, ecologically sustainable and sensitive to conservation issues. Our hopes are to protect and promote the survival of the forest and animals that inspire us, and to leave this magnificent land better than we found it. We hope that our guests are able to enjoy the lodge and the balance we are trying to strike between nature and comfort. Our wish is for people to be able to enjoy this incredible area, and take some knowledge about it home with them.